Rifling is the process of making helical grooves inside the barrel of a firearm. It is done to provide the bullet with gyroscopic stability for optimum range and accuracy. After the machining process of rifling, the surface produced is uneven and hence finishing is required to reduce the surface roughness. Low value of surface roughness is critical which can otherwise decrease the muzzle velocity, range, and accuracy. High value of surface roughness can increase the friction heat loss leading to the overall low life of the barrel. It can also result in bullet material deposition inside the barrel leading to metal fouling which requires successive cleaning of the barrel. Surface finish influences functionality, efficiency, and output of the machined part. Magnetic abrasive finishing (MAF) is a finishing process which uses magnetic field to accomplish finishing. In the present research work, the barrel of a 0.32 in. revolver was finished using MAF. The barrel had high and uneven surface roughness before finishing with Ra value varying from 600 to 900 nm. The input variable parameters were rotational speed, vertical reciprocation speed, working gap, abrasive mesh size, and abrasive volume percent. With the optimum finishing conditions, surface roughness value as low as 150 nm was achieved. The finishing process was modeled theoretically by assuming an initial uniform surface profile with roughness peaks running circumferentially in the inner cylindrical surface with the abrasive particles cutting these peaks along a helical path. Theoretical finishing rate without the influence of rifling was compared with the experimental results, and the difference between them showed the effect of rifling on the finishing rate. The effect of rifling on the finishing rate was analyzed by using regression analysis. We are very thankful of BASF, Germany for supplying CIPs of different grades for our research work. We thankfully acknowledge the help of staff members of Manufacturing Science Lab, IIT Kanpur for providing the facilities to fabricate the tool for finishing the revolver barrel and other attachments. 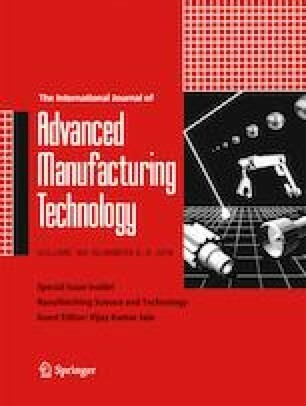 This paper is a revised and expanded version of the paper entitled “Experimental Investigations into Internal Magnetic Abrasive Finishing of Helical Grooves of a Revolver Barrel” by Sahil Kajal, V. K. Jain, J. Ramkumar, and Leeladhar Nagdeve, presented at the 6th International & 27th AIMTDR Conference (2016) held at College of Engineering, Pune, India, during 16–18 December 2016.